UniTween is a Tween framework for Unity that enables programmers and artists to create almost any kind of Tween in a workflow that is easy to learn, fun to use, and with great maintainability. To see how it works, check out this video demonstration or this fancy GIF, and check out the changelog here. For more info on the requirements, how to install, how to use the plugin and much more, check Github. UniTween has been made by Lucas Sampaio Dias, and you can find the project on Twitter too. The Odin Project Validator is an extension to the Odin Scene Validator that allows users to validate project-scope objects like ScriptableObjects and Prefabs. The Odin Projector Validator has been made by Clark Chambers. A handy little ScriptableObject creator which eliminates the need for those annoying [CreateAssetMenu] attributes which are a nightmare to maintain and navigate. Check out the plugin in action here or the BitBucket page. This ScriptableObject creator has been made by Bjarke from Sirenix. Vertex Gradient Editor let’s you set the vertex colors of an object to a gradient of 0 to 1, letting you control each color individually with sliders and save the resulting mesh into an independent .asset file. I started working with shaders more and started wanting to have an easier way to set vertex colors. I’ve been using it to create gradients for my vegetation, so the wind only affects the top of the objects. To see how it works, check out this gif. For future updates, check pastebin. Vertex Gradient Editor has been made by Daniel Snd. Gradient Generator let’s you quickly create small textures with gradients side by side. Create a list of gradients and press a button to generate a texture with them. Most of my artwork nowadays is made with gradient textures - basically all the “texturing” is done by UVing objects on top of a small 128x128 textures that is created by placing different gradients side by side. That way one can change the colors of anything really quickly or even in-game by just changing the gradients. To see how it works, check out this gif or this. Gradient Generator has been made by Daniel Snd. 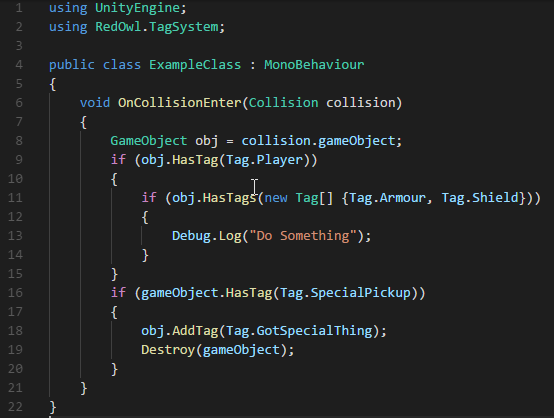 The multi tag system is a Unity gameobject tag system replacement. It allows you to specify multiple tags on a single gameobject so that you can perform more complex logic checks without having to generate hundreds of tags. It comes with a one-stop-shop editor window for both configuring the possible tags and also editing the tags on multi tag enabled gameobjects - via a custom component. It also has gameobject extension methods for easily working with tags from code. Here's a code sample and demo gif. The Multi Tag System has been created by Rocktavious of RedOwlGames. We're a developer and publisher of best-in-class tools and asset for the Unity game engine. We develop and sell but also publish products like Odin for talented developers and artists around the world.